Even if you brush your teeth every day and visit the dentist regularly, it is still possible for your teeth to develop cavities. In fact, a staggering 92% of U.S. adults ages 20 to 64 have had at least one cavity, according to the National Institute of Dental and Craniofacial Research. To protect teeth from further damage after a cavity, dentists recommend placing a filling in the space left from decay. But which type of filling is the best? In this blog post, a Longmont dentist compares the two most common types of dental fillings and explains why tooth-colored fillings are the superior choice to protect teeth from further decay. Dental fillings help return teeth damaged by cavities back their normal shape and function. If you have a cavity, your dentist will first remove the decayed portion of the tooth and then “fill” the area to prevent further damage and preserve the tooth’s remaining healthy structure. 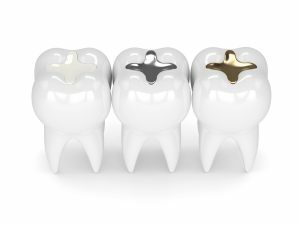 Metal fillings – also called amalgam fillings – are made from a combination of metals such as silver, tin, copper and mercury. Tooth-colored fillings – also known as composite fillings – are made from a mixture of plastic and ceramic. Metal fillings contrast with the light white of tooth enamel, meaning they can really stand out when eating, speaking or laughing. One of the main reasons many patients choose tooth-colored fillings over traditional metal ones is for their more natural-looking appearance. The composite resin of tooth-colored fillings is designed to match the shade of natural tooth enamel, meaning the filling blends in seamlessly with the rest of your smile. Composite resin is softer than the metal used in traditional fillings, which makes it easier for a dental professional to sculpt into place on your tooth. Composite fillings bond directly to the tooth, reducing the drilling needed and preserving more of your natural tooth. Composite resin is safe for everyone and typically does not cause any tooth sensitivity. Tooth-colored fillings can last for 10 to 15 years or even longer with proper oral hygiene like brushing, flossing and regular dental checkups. If you have a tooth with a new cavity that must be treated, a tooth-colored filling in Longmont can provide long-lasting protection against further damage and decay. Even if you already have traditional metal fillings, tooth-colored fillings can be viable replacements in cases of defective or decayed metal fillings, or simply for improved aesthetics. If you are still unsure about which type of dental filling is right for you, speak with a cosmetic dentist in Longmont today. Together, you can make the best decision to preserve your healthy teeth and vibrant smile. Longmont residents have relied on the trusted, family-friendly dental care of Longmont Complete Dentistry for over 30 years. Dr. James Maurer, his son Dr. Dan Maurer, and the team at Longmont Complete Dentistry offer a wide range of comprehensive dental services, including tooth-colored fillings and other restorative dentistry treatments. Patients old and new can contact Longmont Complete Dentistry via their website or by calling the office at 303-772-7000.